We are going on a week's vacation to see the trees in Branson, Missouri. The Chamber Of Commerce said they will be at their peak this next week. I also have a friend who lives there and she said the same thing. So I am very excited! I hope to see the beauty of the Creator all around me. I will take pictures and post them when we get back. I hope we see something like this. Don't you just love Autumn?!?!?! That sounds like such a fun trip! I live in the subtropics and although I love many things about it, I sometimes long for real seasons. 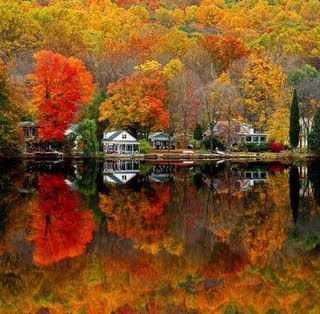 What a gorgeous picture of the trees, leaves and water! Beautiful. Can't wait to see your new pics while vacationing. Won't you see gorgeous sites?!?! May you have refreshing time in Branson. Hope you and your sweetheart are feeling much better. I'm still coughing. Whah. Oh, i'm waiting for your pics! One of the things i miss most about living in the South is the beautiful springs & falls, especially when the hills begin to turn. Have a good time! Have a great time! Is it just you and your husband going? That's a beautiful picture you posted. I am jealous. I love the fall colors. Enjoy and be safe. Please be sure to share pictures with us Linda! Autumn is my favorite time of the year, and all I know of is the Northeast! I cannot wait to see the west! Can't wait to see your pics. Have fun and stay safe. That sounds like a wonderful trip! I hope you have a great time!! That would be so awesome to see such pretty colors! Yeah – a friend told me to try out Picnik.com. It was really easy and I love how it brought out more color in the pictures. I just LOVE fall! There’s something about the changing of the seasons that is so refreshing – a reminder that God’s work in us is never finished and that he is always changing and molding us into who He wants us to be. Hmmm…maybe that should be my next blog topic. By the way, I LOVE your picture too! This picture has to be a postcard!! Is it? It is just wonderful and could sell anyone on a trip there.